If you are wondering how to burn a CD, here is a simple guide to use right away. CDs/DVDs are used to store any kind of data you can think of: movie, music, data and other digital formats. Before starting to burn your files to a CD, you need to make sure that your CD-Rom is capable of burning CDs. Normally, DVD-Rom burns files to CDs but not to DVDs where as DVD-RW (writer) burns both CDs and DVDs. In addition, you need CD burning program. This is not a must since Windows has built-in burning software to back up your computer data easily. However, using CD burning applications will let you to burn and compile any type of data efficiently. These applications also incorporate several features that enhance your usage of CDs and DVDs. -	Playing music from your CD and some more support. As you guess, you will get enough support if you use CD burning application. I personally recommend using burning software for any kind of data burning. We will see both ways here. Open Windows Explorer (Press Windows Logo + E, to open it) to access the files you are going to burn. On your mouse Right Click on the folder or file you want to burn Select ‘Send To’ from the drop down menu then click on CD Drive (normally, D or E or your CD writer name) to send it to the CD Writer. On the Status bar Windows tells you that files are ready to be written to a CD. You can click the balloon to open the writer wizard as the following screen shows. As you can see I have sent two photos ready for burning. You can send as much as files to your CD/DVD writer. But it shouldn’t exceed the limit of your CD. Normal CD-R holds 650MB and DVD-R holds 4.7GB. Also the type of disk you use will determine the integrity of your files. If you use CD-RW/DVD-RW disks, data can erased easily since these types of disks are rewritable. It is recommended to use CD-R/DVD-R for backup your important data. 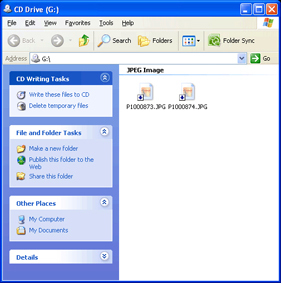 Now you are finished sending files to the CD writer, insert a blank CD/DVD into the writer. When you are ready, to start burning Click ‘Write these files to CD’ under CD Writing Tasks title as shown on the above wizard. Windows will bring the writing wizard and asks to name your CD. Enter a CD name as you like or accept the default then click ‘Next’. Depending on the size of your data the wizard will take some time to finish the burning. The writer will eject the CD on finishing the writing process. Click ‘Finish’ to complete the job. Now you can insert back your created CD and check whether the files are burnt on the CD or not. This is the easiest method to burn a CD using the built-in Windows CD writing tool. This method helps when you want to burn files directly from your computer. I hope this will answer your question of how to burn a CD. But, how about, if you want to copy an original CD, you surely need CD burning software to do this. There are several kinds of CD writer applications (freeware and commercial) available on the market. Usually, the free ones have few features than the commercial. It is up to you to decide.